First Paragraph(s): Oz Chambers sat in his bedroom, desperately trying to concentrate on his algebra homework and ignore the tempting bottle of blood on his desk. He dragged his eyes away from the crimson phial and struggled with two maths questions, before trying to get to grips with the essay on “Sir Gawain and the Green Knight” he’d been dabbling with all week. He liked English, and especially reading, but that didn’t make the essay any easier. Oz sighed heavily. It was no good. Today was proving to be a particularly hopeless homework day because he just couldn’t settle. He was simply too excited by the prospect of what was in store that evening. Hi there, Esteemed Reader! Happy Thanksgiving! The Obsidian Pebble is to be my last Book of the Week of 2013 and it's a great one to go out on. The Obsidian Pebble is a hard book to sum up. 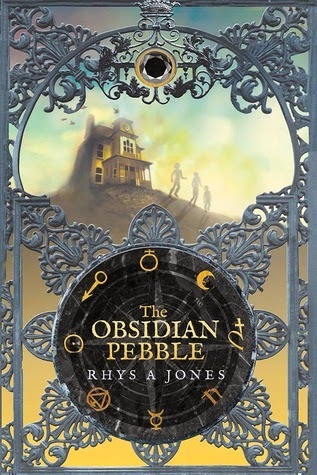 It's a haunted house story, a superhero-ish story, a story about a boy dealing with the death of his father, and above all, an extremely English story:) It's vaguely reminiscent of the best parts of Harry Potter, but The Obsidian Pebble is it's own wonderful concoction. “I wish I had a long-lost uncle who would leave me something in his will. Wouldn’t it be great if it’s your sixteenth birthday and a crusty old lawyer bloke turns up with a crinkly yellow envelope full of stocks and bonds and stuff worth zillions?” Ruff was looking at the ceiling, but his eyes were seeing something else altogether. Oz didn’t really know what stocks and bonds were and neither, he suspected, did Ruff. But they sounded really impressive. “As if that would ever happen to anyone,” Ellie tutted. “I didn’t know that,” Oz said. “Looks more real in a book, though, somehow, don’t you think?” Ellie said. Oz knew what she meant. He made a mental note to look it up next time he was in the bookshop. The real fun begins when Oz finds a package addressed to him, posted the day before his father's death. Obviously, a package like that must contain something of importance, and this one contains the obsidian pebble. I won't spoil the secrets this tale holds, but the pebble has powers most curious which lead Oz into a wonderful adventure you're going to enjoy. The second bit didn’t sound too bad when he read it back. In fact, it didn’t sound like an illness at all. Unipolar sounded more like something you might use to repair a broken radio. But there was nothing easily fixable about the way his mother wouldn’t eat, or didn’t want to be hugged, or didn’t shower, or slouched about in a dressing gown for days at a time. There was nothing he could buy from an electrical shop to stop her crying for hours on end. Boggs turned in disgust and marched to the front of the class. When he reached the blackboard he pivoted to face the whole of 1C, wearing a sour-faced scowl. Not to worry, Esteemed Reader. I have more favorite passages for you. And as we've reached the end of the review, it's a good time to break them out. If you're looking for an enjoyable fantasy with heart, don't miss The Obsidian Pebble. They crossed a passageway to another door, which opened out into a large, shabby-looking entrance hall with a massive double staircase leading up to the floor above. The place smelled musty and unused and their voices echoed into the chilly emptiness when they spoke. There was no sound at all in the atrium as midnight approached, but outside the wind moaned as it gusted around the stone walls and beams creaked as the old place resisted the elements. Oz finished adjusting his watch and reached down to pick up the bottle when a noise made him start. Footsteps. Oz looked up suddenly. Maybe Ellie wanted something else from the kitchen. More likely it would be Ruff. But there was no one there. He started to climb the stairs again. Must have been his imag… Oz stopped and stood stock-still. Soft and deliberate and sounding very near, the footsteps came again. She was a small, thin girl with elfin features, short dark hair and a constantly intense expression. Her clothes were shapeless and fashionably drab and she’d gone for “backwards through a hedge” as a hairstyle, with great success. Whoever had thought up algebra should have been hung in a gibbet, like they did to people in Sir Gawain’s time. These sounds wonderful, thanks for the review. Off to add it to the TBR pile. Thanks so much for spreading the word about Pebble. I am so glad you enjoyed it. And as for Boggs...let's just say he has 'come uppance' stamped all over him. Oh, and best of luck to you and yours with the forthcoming arrival.